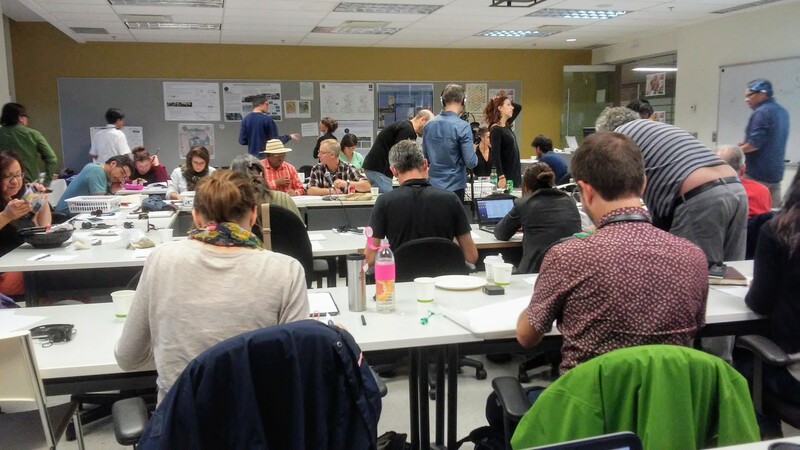 The MappingBack project takes finds origins in a three-day workshop organized in Montreal in October 2017. 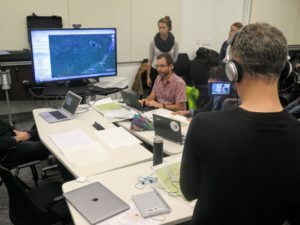 This workshop brought together 35 participants from three communities of interest into a collective exchange over the place and possibilities of mapping in indigenous‐extractives conflicts: The first were representatives and members of First Nations with an engagement with, and interest in, the representation of territory; the second were cartographers, both researchers and practitioners; and the third community was made of university-based researchers with expertise on extractivism. Together these participants inquired into forms of cartographic expressions that can represent the multiple issues, perceptions, meanings, histories and emotions that are at stake when industrial extraction enters Indigenous territories. They also explored how maps could be used for purposes of resistance and resurgence, including for education, historical memory and ancestral knowledge and oral histories, assertions of territorial rights and community visioning and life-plans, and decision-making. 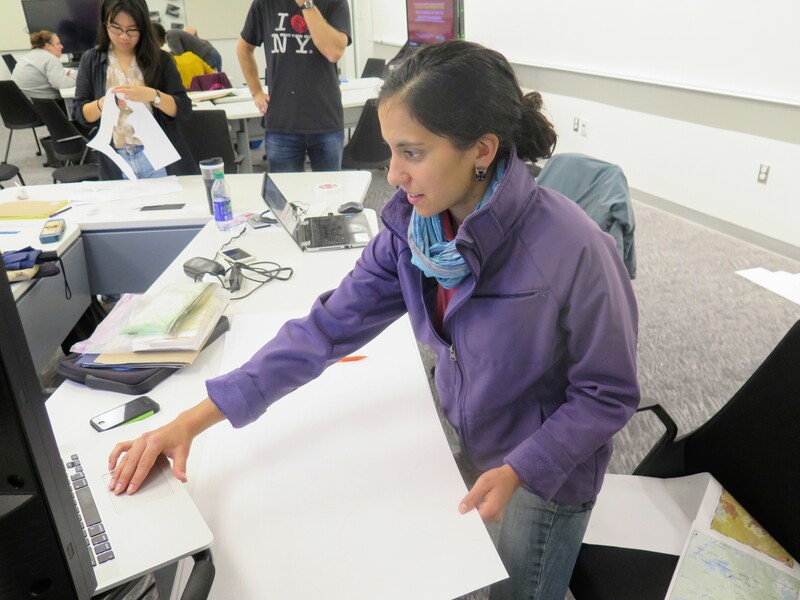 This workshop was seen as a foundation to develop the online Indigenous Mapping Platform that you are now exploring! The goal of this workshop and of its companion Mapping Platform is thus to provide references, suggestions, ideas and methodologies designed by and with Indigenous communities to represent in meaningful ways the multiple dimensions of such conflicts. The initial workshop in 2017 was initiated by three western researchers (two men and one woman) without any Indigenous background but with a strong interest on different aspects of Indigenous issues and with long term collaborations with communities. Three graduate students (two women and one man) later joined the organizing committee of the workshop. Although it would have been possible to somehow alleviate this lack of Indigenous presence in the organizing committee of the workshop, by inviting some of our Indigenous collaborators to join it, we opted for a more “fluid” process in which Indigenous partners that express a real interest in the project over time would be encouraged to take a growing role in the steering committee. At the moment the MappingBack steering committee is made of seven members (four men and three women), including two Indigenous members. 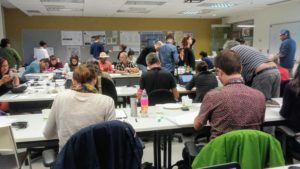 The organizers sought to leverage their access to resources including technical skills, scholarly training, and institutional resources to create a space for creative and collaborative production that could be in service of collaborations that address Indigenous communities’ needs and desires. Throughout the workshop planning and design, this entailed ongoing reflexivity on questions of inclusivity, voice and methods for participation. 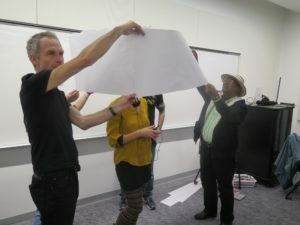 This workshop was trilingual (English, Spanish, French) with simultaneous translation, but no translations into the six other languages spoken by Indigenous participants. It brought together 35 participants from three communities of interest into a collective exchange over the place and possibilities of mapping in indigenous‐extractives conflicts (see Figure 4). The first were representatives and members of First Nations with an engagement with, and interest in, the representation of territory. These were people with experience in cartography, people who had reflected upon the uses of (and dangers of) Occidental mapping and the alternative ways to represent the significant dimensions of their homelands. They came from different points of the Americas (Alberta, British Columbia, Québec, United States, Mexico, Panama,) each on the frontlines of struggles with large-scale resource projects (fossil fuels, hydro, mining and forestry). The second were cartographers, both researchers and practitioners. Some were First Nations cartographers working to develop an Indigenous cartographic idiom. Others have collaborated closely with indigenous communities in the production of maps and other spatial models, while others were experimenting with what map‐making could be in domains such as critical political economy, representational rhetoric, spatial aesthetics and conventions, narratives and the non‐visual senses, grassroots and collaborative mapping. Finally, the third community was made of university-based researchers with expertise on extractives. They brought to the table their work on the multiple facets of historical and contemporary resource extraction, across sectors and across the Americas; on the politics of knowledge that surround extractives conflicts; on the global co‐ production of socio‐ecological mapping such as for example in the online Atlas of Environmental Justice (ejatlas.org) or the Climate Alliance Mapping Project. 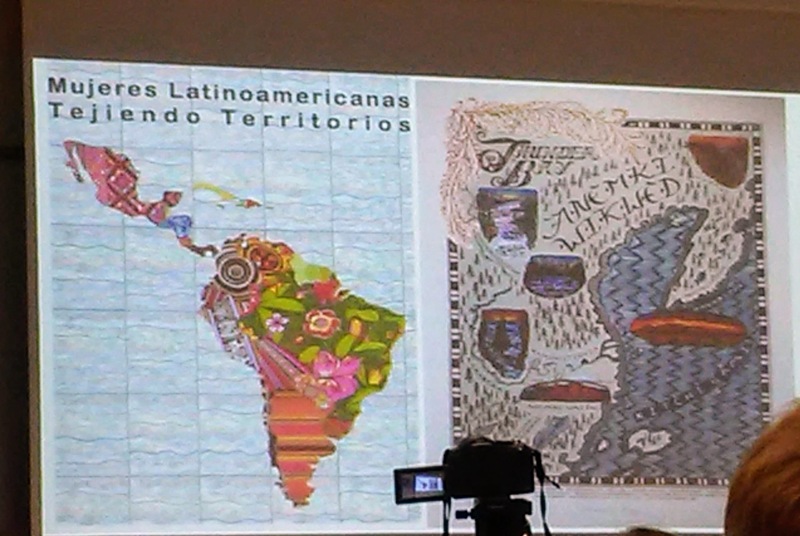 Members of these three communities were invited to work together for addressing three main issues: (1) the different dimensions of extractivism and the dynamics and conflicts that unfold in the fields of culture, ontology, temporality, ecology, health, and economics when extraction invades a homeland; (2) the representational strategies and languages that express indigenous spatial world-views, narratives and symbolic meanings attached to contested territories and; (3) the social process through which these spatial histories and memories were shared, co-created and on the life of the maps presented, including tensions and synergies identified in the process of co-production. Although attention is often fixed to a map as a product the workshop was equally focused on the processual aspects of spatial representation. Every map has a life story that moves from territory and original goal of the map to data collection, analysis and cartographic design and then to its subsequent career as it is taken in, used and socialized (see, for example, Dodge et al. 2013). This brings attention to the social process through which spatial histories and memories are awakened and shared for recording through the process of map creation. Understanding and controlling the message conveyed with the map may be as important as understanding and controlling the map making process and the design decisions. To address these issues, the workshop was organized in two parts of one and a half day each. During the first half the participants presented issues, needs and possible solutions related to the mapping of extractive conflicts on indigenous homelands. This first part enabled participants to lay out different aspects of the issues at stake as well as to present their own needs and potential solutions to address them. This first part also enabled the participants to start to know each other in preparation to the second part of the workshop. Mapping time according to first nation concepts of time applied to Eeyou Istchee (Wemindji, Canada) and Dene (Canada) territories. Each group was made of 5 or 6 participants from each of the three communities identified earlier (i.e. Indigenous communities, cartographer, scholar-activist) including a facilitator from the organizing committee. During one and half day each group worked together to first better understand the specific issues at stake and its context and then to sketch at least one spatial representation to address it. Beyond addressing the core question raised at the beginning of this section, the workshop aimed (1) to begin building a nucleus of cartographers, researchers and communities interested in working together on developing new forms of spatial expressions dedicated to better embody and express Indigenous perspectives about places; and (2) to serve as a launch pad for creating a non- traditional collaborative online platform that would provide mapping examples and solutions to express Indigenous perspectives on resource conflicts. A first material outcome from the workshop was the production of sketch maps combined with a narrative of the process of their production. As discussed earlier in this paper, the process is as important as the outcome in Indigenous mapping. In fact the process cannot be dissociated from the outcome. 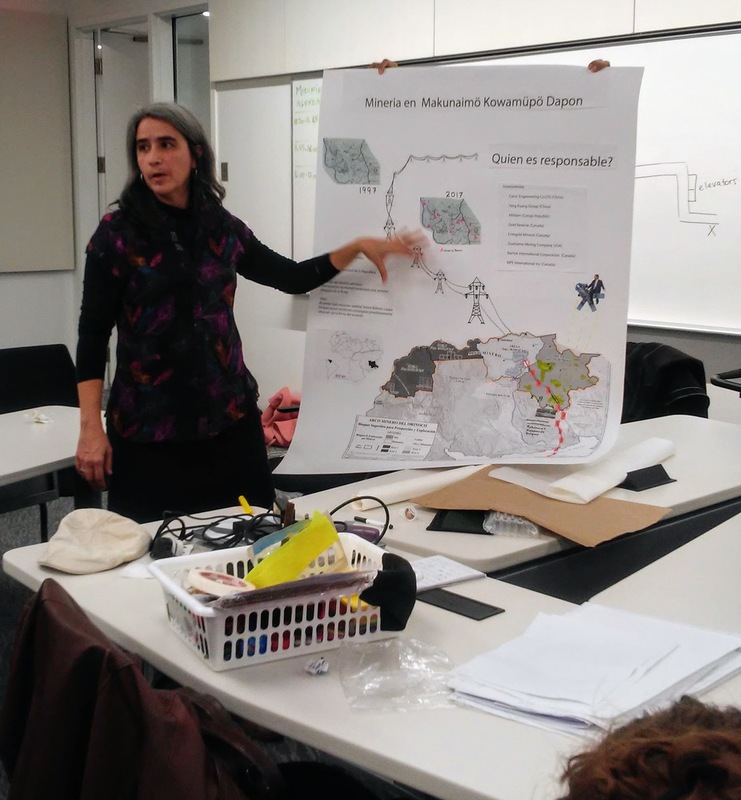 This combination – spatial expression/mapping process description – is a fundamental dimension of this project since it enables Indigenous communities to express their unique relationships to the land in non-conventional cartographic forms, while explaining the meaning of these spatial expressions beyond their cultural environment. Four of these projects and that emerged with them are featured in the Supported Projects section of the Gallery of the present website.